You don't have to be a graphic designer or web developer to create your own font. Looking for an easy way to turn your handwriting into a font for free? There are several ways to do this, and several websites that make the process extremely easy. Want a free way to turn your handwriting into a font? There are several ways that you can go about doing this. As mentioned above, the most popular way to create a font from your handwriting is to use a web based font converter. However, there are a couple of other methods that work too. For example, if you have a graphics tablet such as a Wacom tablet, you can simply record your handwriting using an app. From there, you can convert it to a font pack yourself. This is how most graphic designers create fonts and typography. New touch screen tablet computers, such as the Apple iPad, are equally capable of creating fonts from handwriting. Although there may not be an app out yet that specific purpose, someone will eventually create one. For this tutorial, we will be using a website to create our font. This is the simplest way to do it, and most people will have the hardware for it. You will need a printer and a scanner. Let's get started. Now, this tutorial is designed to show you how to make your own handwriting into a font, completely free. Upon searching for this solution on Google, you will find that 99% of websites charge you a fee to actually give you the handwriting as a True Type file. True Type is a simple font format that makes fonts usable in Windows and Mac. With a True Type font file, you can install the font and use it in applications such as Microsoft Word and Photoshop. Prices typically range from $10 to $50. The majority of tutorials out there have hidden prices. For example, they will tell you all of the steps to create your font. But on step 4, they may say "now you need to purchase this program." An example of this is MyFirstFont.com. The majority of websites out there that will convert your handwriting into a font state that you don't have to purchase the font if you're not completely satisfied. Thus, you can test the font in a text editor before deciding to purchase. An example of this is YourFonts.com. Still, these sites are not free. Upon searching the web, I did find one free solution. The site is called KevinandAmanda.com. Kevin and Amanda will turn your handwriting into a font for no charge, completely free. However, you must follow some specific guidelines, which can be found at the above link. Upon submitting your font to Kevin and Amanda, if you follow the guidelines, and the font is chosen, you will receive an email with your new font. It is very nice of someone to take the work out of this for you, and spend their own time creating a font. Thus, be sure to thank them if your handwriting should get chosen. Upon acceptance of your font, they will post it on the KevinandAmanda site for all to download. Most likely, they will also take the font that they have created from your handwriting and go affiliate sell it on FontGarden. There are other free ways to do a handwriting to font conversion. However, the majority of them require you to have a tablet PC or Wacom pad, which the majority of people do not own. Sites like YourFonts.com are not bad. $10 is a fairly low price for anything. 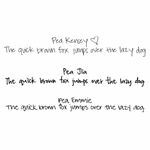 If you can find another website that offers completely free, no hidden charge handwriting to font conversion, please leave the URL in the comment section below. Click here to see the entire alphabet in different fonts! Click here to check out the latest Old English fonts! Click here to check out the latest trends in typography!